So I’m putting all things pumpkin on hold today to bring you an apple-related recipe. Yup, I just said that! Long before pumpkin spice became so popular, apples have always reminded me of fall. And while we have plenty of apples in our house year round (I’m staring at three different varieties on my counter right now! ), they are absolutely a fall staple, and a must-have in fall desserts. 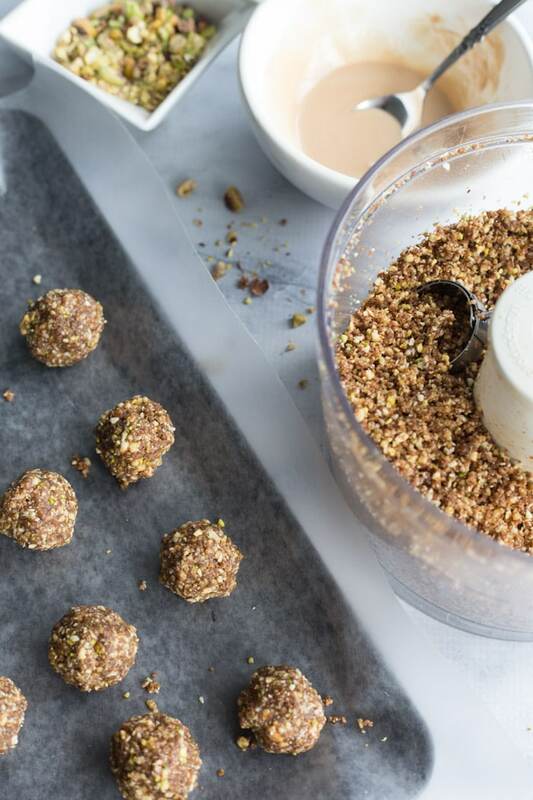 Today’s recipe for Apple Cinnamon Energy Balls is of the snack variety, but with the salted caramel chip drizzle, it could do double duty as a dessert! Okay, I will admit that I have a lot of pumpkin related recipes I want to share this fall, but there are also a few apple recipes in my back pocket that need to come out. And since I have a slight obsession with energy bites (or energy balls, or power balls, or whatever you want to call them! ), what better apple recipe to start with than these Apple Cinnamon Energy Balls. And the best part? 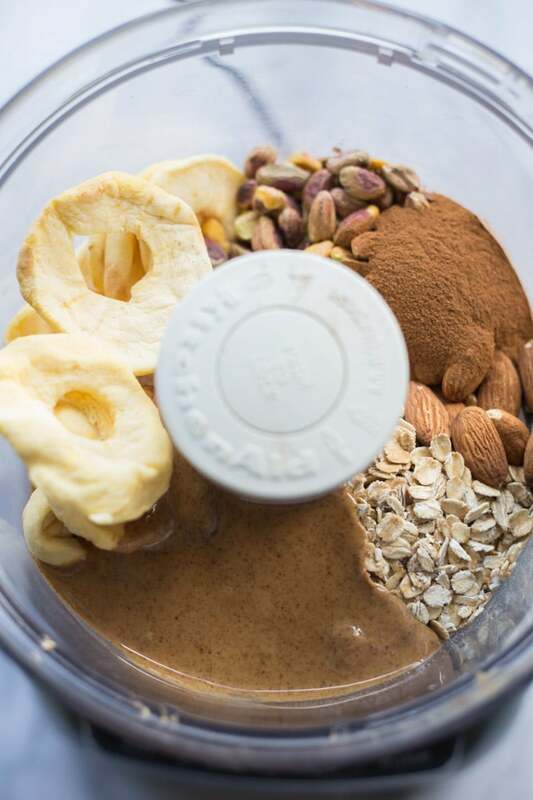 You don’t need to peel or chop apples for this recipe. All you need are dried apple rings from your local bulk food store! 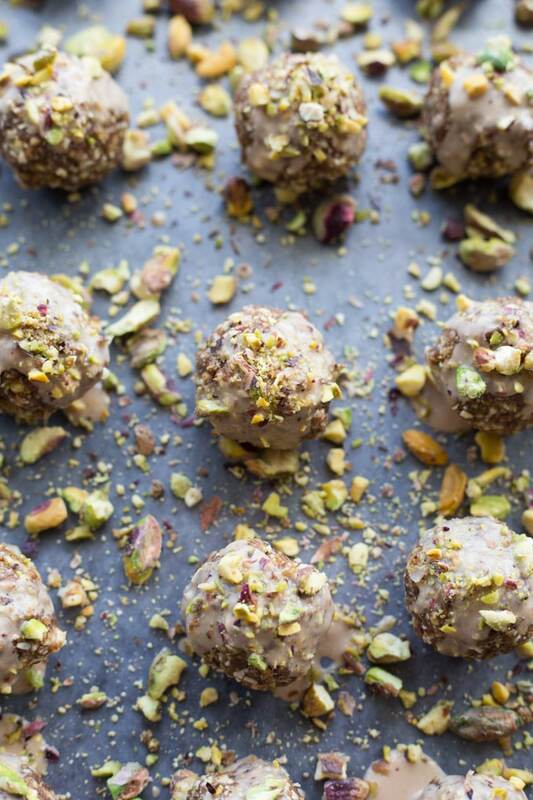 Similar to my other energy bite recipes, like these Chocolate Hazelnut Energy Bites or these Pineapple Coconut Energy Bites, these Apple Cinnamon Energy Balls are quick, easy and packed with clean eating ingredients. We’re talking cinnamon, dried apple rings, almond butter, almonds, pistachios, gluten-free rolled oats and maple syrup. That’s it! Clean and simple. I actually think this recipe is easier than my other energy bite recipes. There is absolutely no oven time required and the ingredient list is pretty short and sweet. You really just throw all the ingredients into your food processor or blender, and in 5 minutes you have a crumbly mixture that you just roll into balls and refrigerate. Done! Energy snack ready to go! As you might expect from me, I’ve included an optional drizzle for these bad boys. And note, this drizzle is not clean eating. That’s why it’s optional 😉 . But as I’ve explained before, I also like balance and the occasional touch of decadence, and I think some melted sea salt caramel chips are perfect for these Apple Cinnamon Energy Balls. It complements the flavour, and turns these little bites into more of a sweet treat. Totally appropriate for a post-meal dessert! And….I think I’ll leave it there for today. Like this recipe, this post is short and sweet! 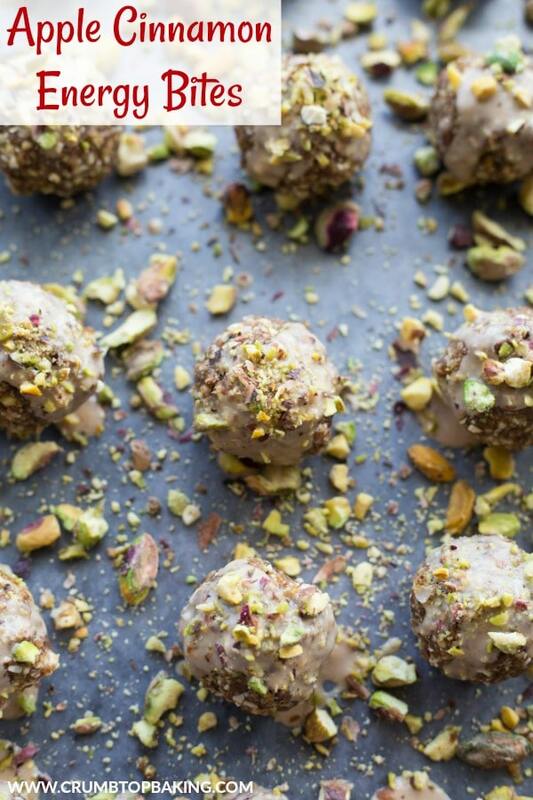 But I bet I have you thinking about these energy bites for breakfast now?! Totally tempting, isn’t it?!?! 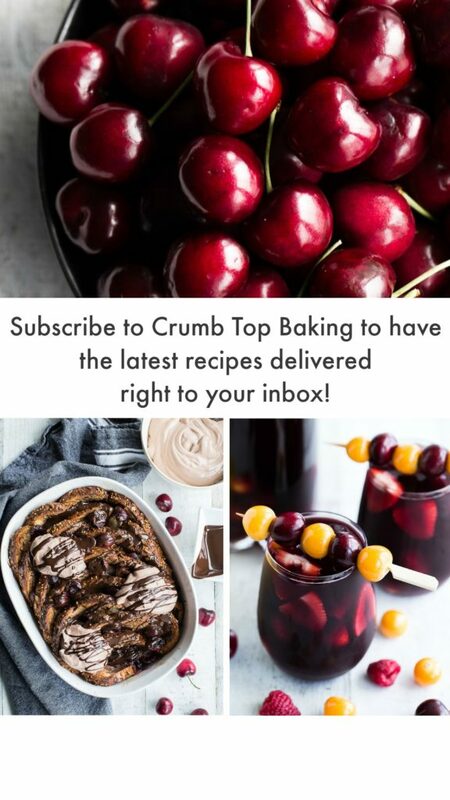 If you make them, be sure to let me know in the comments below or take a pic and tag it @crumbtopbaking on Instagram! 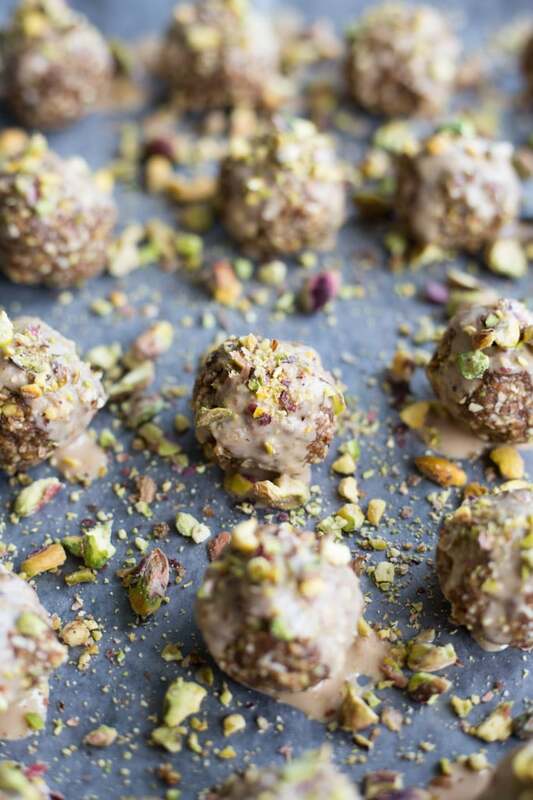 Apple Cinnamon Energy Balls are quick and easy to make and packed with fibre, protein and clean eating ingredients like cinnamon, dried apple rings, almond butter, almonds, pistachios, gluten-free rolled oats and maple syrup. Top them with a sea salt caramel drizzle for a decadent treat! Add all the ingredients, except the sea salt caramel chips and coconut oil, to a food processor and process on high until the mixture is crumbly (see note). Roll the mixture into balls and place on a wax paper lined baking sheet. You should get about 20-22 balls. Place the chips and coconut oil in a microwave safe bowl and heat for about 30 seconds. Remove and stir the chips until fully melted. 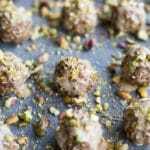 Drizzle a little bit over each ball and sprinkle with crushed pistachios. Place in the freezer for 30 minutes or until the drizzle has set. Store in an airtight container in the fridge and enjoy within 4-5 days. You can also freeze them for later enjoyment! 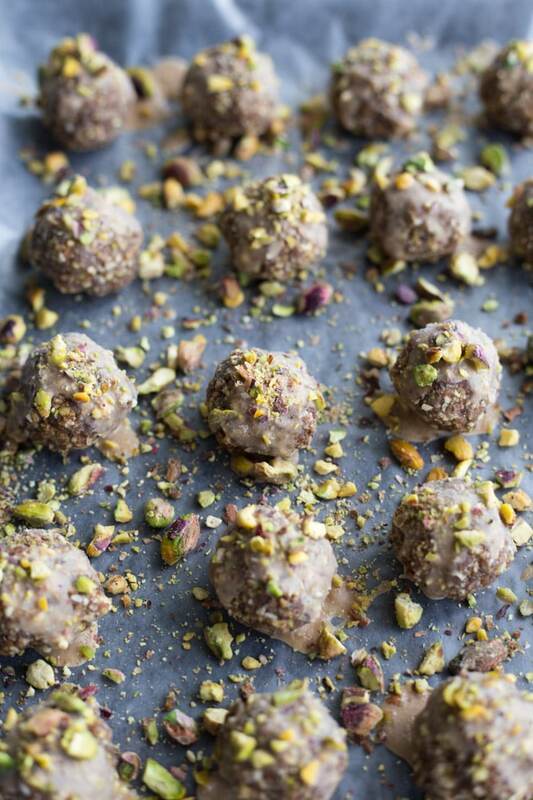 I was also able to make these energy balls in my Ninja Blender, as it is pretty powerful. While it worked fine, the food processor was much quicker and easier. The salted caramel chip drizzle is completely optional.